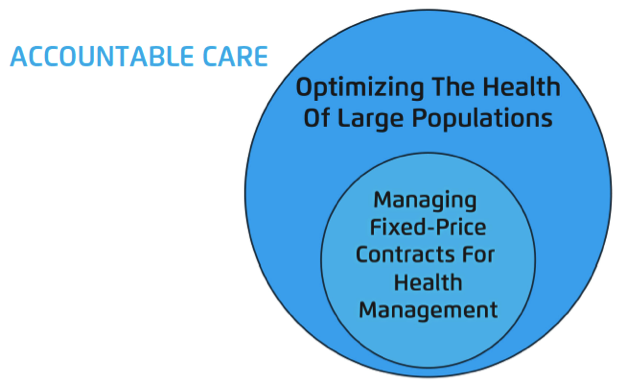 It appears that “population health management” (PHM) just has a better ring to it than “accountable care” or “HMO 2.0”. Increasingly, PHM is becoming an umbrella term for all of the operational and analytical HIT tools needed for the transition to value-based reimbursement (VBR), including EHR, HIE, Analytics, Care Management, revenue cycle management (RCM), Supply Chain, Cost Accounting, … . On the other hand, HIT vendors continue to define PHM according to their core competencies: claims-based analytics vendors see PHM in terms of risk management; care management vendors are assuming that PHM is their next re-branded marketing term; clinical enterprise data warehouse (EDW) and business intelligence (BI) vendors argue that a single source of truth is needed for PHM; HIE and EHR vendors talk about PHM in the same breath as care coordination, leakage alerts and clinical quality measures (CQM); and so on. We at Chilmark have not articulated a single vision for where PHM ends and all other VBR related HIT begins for the simple reason that “It Depends.” It depends on where you are starting, it depends on your existing IT infrastructure in place, it depends on the community you serve and the structure of your clinical team (acute, ambulatory, long-term care, affiliate vs owned mix, etc.). There is not an easy answer here. That being said, we are in the process of articulating these issues in a forth-coming Insight Report and it appears that Dale Sanders, SVP at Health Catalyst, has jumped the gun with his own articulation of PHM and what is required to be successful in his recent Population Health Management report. Note: Vendor-produced papers that rank the sponsoring vendor in question as the top dog are often easily dismissed as biased, despite any claims of impartiality on the part of the author. This one I found worth the read, however, despite such bias. However at this point in time, there is a huge disconnect between groups dedicated to PHM — quality and care mgmt. groups — and those dedicated to financial & risk mgmt. In one recent conversation with an HCO executive, he mentioned a HCO in their region that had aggressively moved towards VBR, a push by senior executives including the CFO, that was ultimately rejected by clinical executives leading to exodus of CFO and a number of other executives. This division between clinical and financial leads us to propose the following Venn that represents where we are today. As the above diagram shows, we are seeing the line between PHM and financial mgmt. blurring over the last few years. 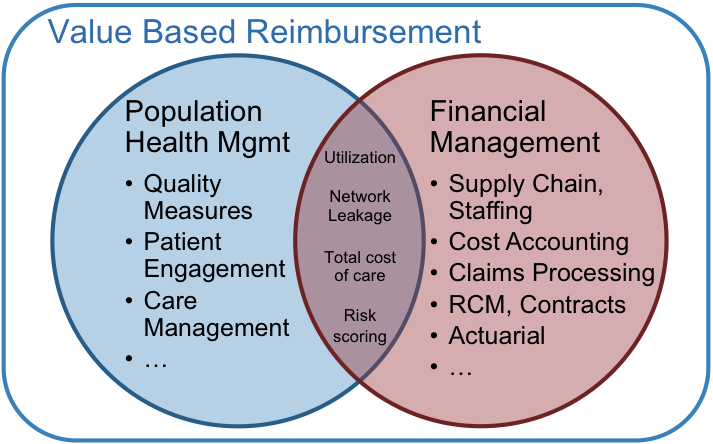 Network leakage, total cost of care, utilization KPIs, risk scoring, etc. are increasingly being discussed in the same breath as PHM. These financial data are desired by HCOs to better manage population risk — across both care management and performance management functions. For example, a care manager might wish to view the predicted total cost of care for a set of high-risk patients; or a risk manager might want a dashboard that combines paid-claims-based risk scores with clinical-based quality measures. 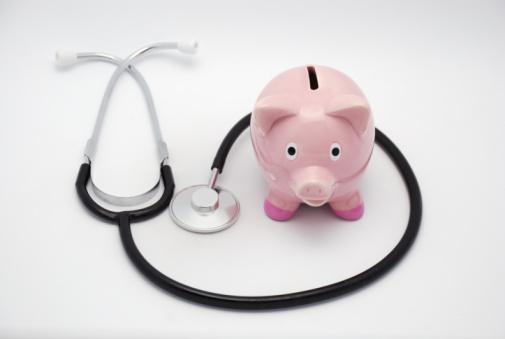 Going forward, I don’t know if financial departments within HCOs will ever become fully united with clinical teams under the common purpose of PHM and more broadly, VBR. I however do see the “bleeding” increasing, as cost accounting systems, and elements of RCM and staffing become more intertwined with PHM needs in support of a VBR strategy. My upcoming 2014 Population Health Analytics report will explore these and many other trends further… and thanks to Dr. Sanders for the catalyst to write this post. And whether or not Dale Sanders prematurely articulated or not, his “12-Point Review of Population Health Management Companies” definitely looks worth the read. ? I’m thankful you/Chilmark so graciously shared it. I always look forward to information from Chilmark.